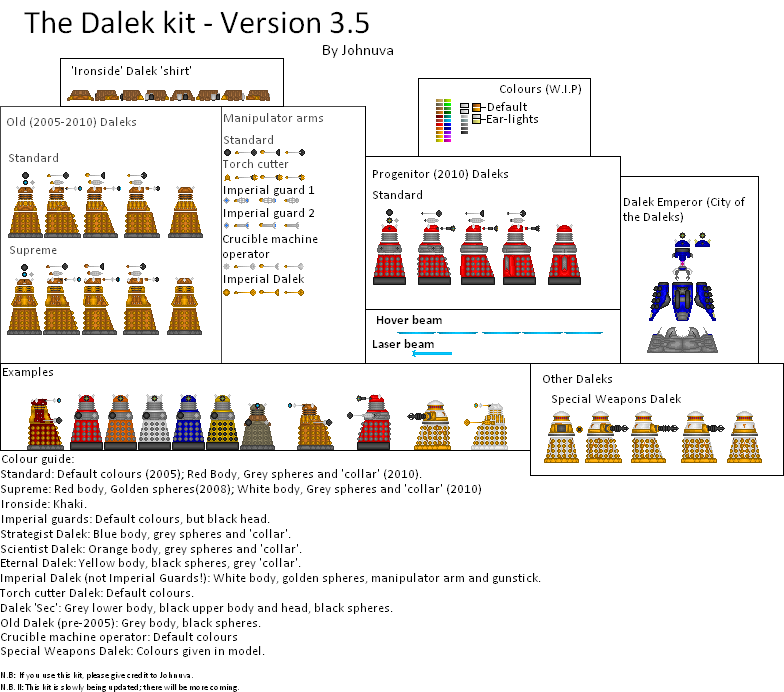 I recently updated my old Dalek kit (again) - this time, it has gone from being a three-shade kit to being a seven-shade kit. 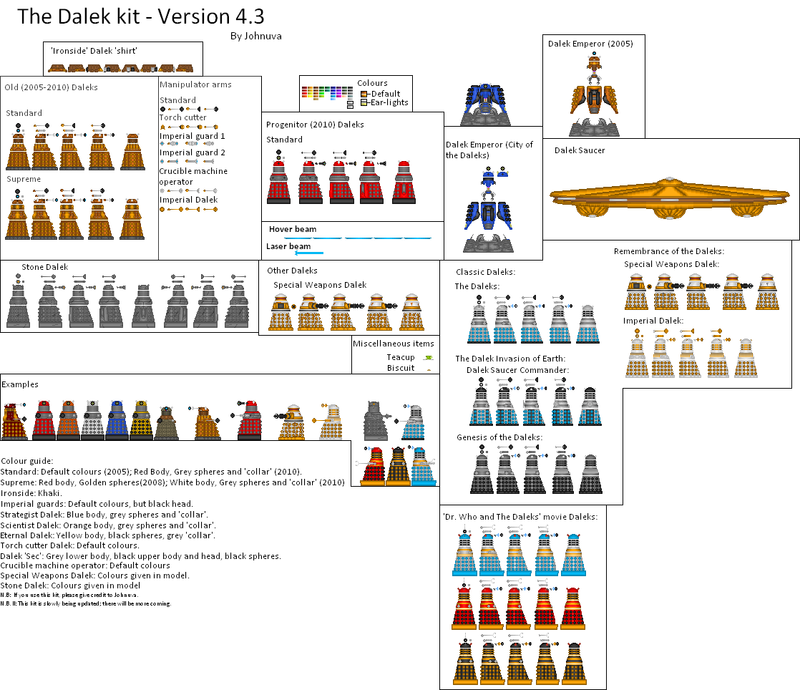 I have also updated the older Daleks themselves - the diagonal side view is slightly different, which allows the weapons to be put on easier. I like it a lot more than I did when I first saw it, now that I know what it actually is. As said before, this is a brilliant idea. And as said before, I may make a Davros so you don't have to. 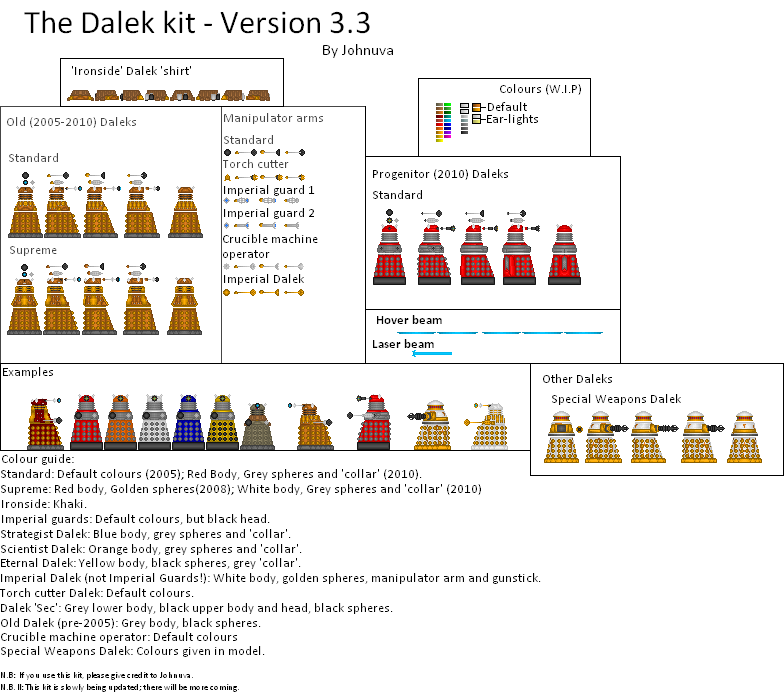 I've seen all of a Christmas special, parts of various episodes, and the cliffhanger to "Remembrance of the Daleks." Most of my knowledge about the series comes from information from fans, like how Steven Moffat feeds off of fear. He does; he takes fears of children (dark, moving statues etc.) and turns them into plot lines. Thanks for the feed back, guys. 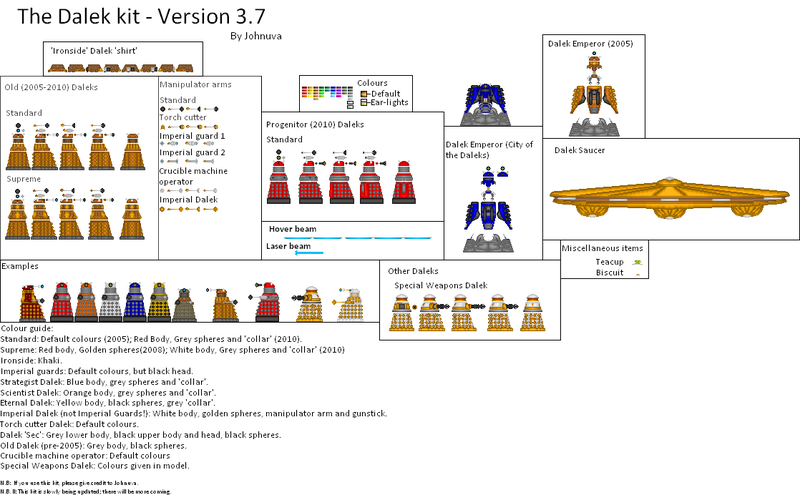 ** A new blue, which is now the strategist Dalek's main colour, as I view it as more realistic to the Dalek in question. ** A skin-like colour, which came about due to my (failed) attempts to make a Doctor sprite. * Progenitor Dalek gunstick edited. ** The Gunstick is now thinner (less bulkier) and has a black circle in the middle. This is to make it more akin to it's counterpart in real life. 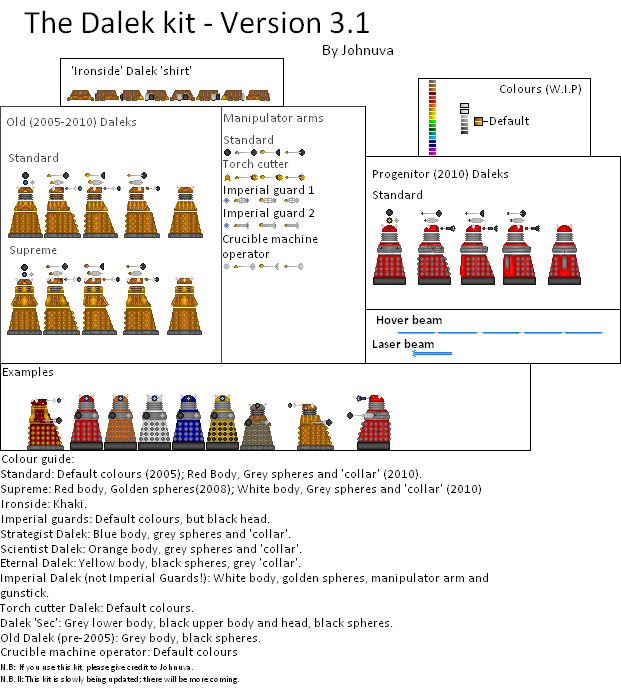 * Imperial Dalek example changed, going from 2005+ model, to the model given as a classic Dalek. ** The head is now more rounded, and is the same shape for all the views, which is more like the real Dalek. 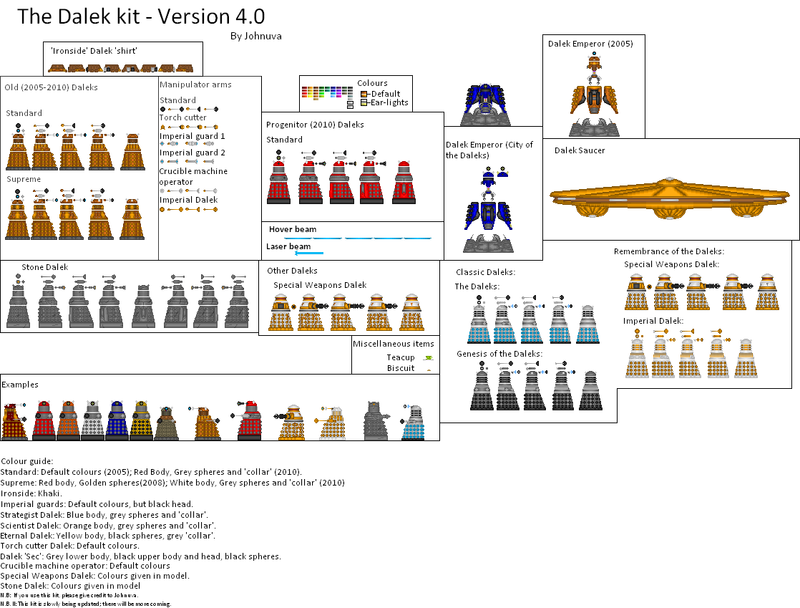 * 2005+ Dalek gunstick thinned, and 2010+ Dalek gunstick lengthened. ** This orange is now the new scientist Dalek default colour - the other orange is, in my opinion, slightly too red to be a 'true orange'. *** This is another good thing about these colour updates - the older colours are still in the palette, so you can revert to the old colours if you dislike the new ones. ** The 'Saucer Commander' in the Classic section now has a dish on its back, which it had when it appeared. This image is a comparison between different versions of the 2005 Dalek model. The original was made in 2007. Version 2.0 was made in 2010. I plucked 3.7 out at random to avoid having to spend too long with making this comparison table. It, too, was made in 2010. 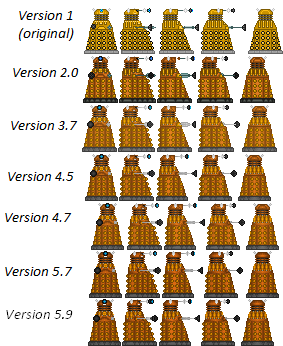 Version 4.5's Daleks are drastically different. Everything has changed in some way or another - the torso has been straightened, the gunstick and eyestalk have been shortened, the skirts have been thinned, and the head (second view) has been changed as well. So, guys, what with This new update, what do you think? 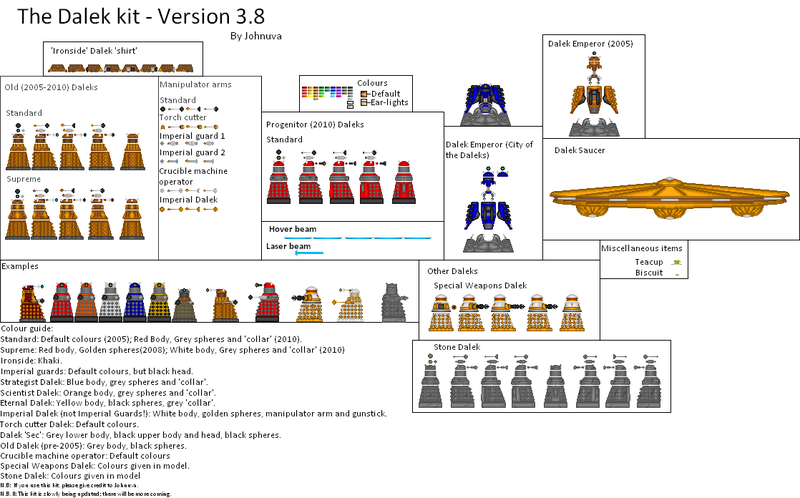 N.B If any of you choose any version below 3.7 as the better Dalek model, you shall be EXTERMINATED.